Comodo Antivirus for Linux is equally good as Comodo Windows Antivirus. It performs cloud-based behavior analysis of files to deliver 360 degree protection against unknown and zero-day malware. It ensures proactive Antivirus protection to stay ahead of all known and unknown threats. It also features email filtering for Linux based computers to filter spam and block email-borne threats. Install and forget. No annoying false alarms, just solid virus protection. I have used it; you'll like it and find it beneficial. Take it and stay relaxed. Spam Mails killed our performance until one of our IT guys suggested Comodo Antivirus for Linux. It works. When you try using the product you will agree to what I say. With Comodo Antivirus for Linux your stuff remains safe and secure! Comodo Antivirus for Linux is unique and perfect. Thanks, Comodo! 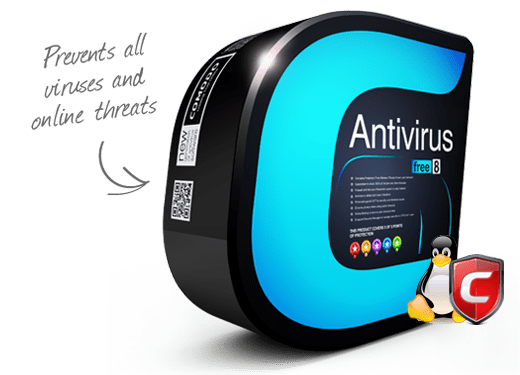 Does Linux require an anti-virus? Definitely. It used to be the case that Linux was not heavily targeted by malware writers for two main reasons. Firstly, the general popularity of Linux amongst home users wasn't very high. This meant hackers had a low number of potential victims and hence a low 'return on investment' for their efforts. It was always far more lucrative to attack Windows because of its large user base. Secondly, the fact that there are many variations (distributions) of the Linux OS meant virus programmers would have to create and test separate attack code for each of them. Compare this to Windows where a single virus code is capable of infecting everybody that uses the operating system. In the past few years, however, both these points have been eroded. Firstly, there is a general increase in the popularity of the OS with more and more home users adopting Linux. The fact that major computer distributors like Dell are shipping desktops and laptops with Linux per-installed is testament to this shift. Secondly, the run-away popularity of easy-to-use distributions like Ubuntu has consolidated the fragmented Linux user base. Unfortunately, this makes it easier for hackers to create a single piece of virus code that will hit millions of users. Why should I use Comodo Antivirus? Our software features best of breed anti-virus protection, a constantly updated virus database, on-demand and on-access scanners and a powerful mail gateway that prevents spam and malicious emails from reaching your inbox. It is, of course, also free of charge. Can I automate the anti-virus scanning process? Yes. The built-in scheduler allows you to timetable scans to run at a time convenient for you. What is the mail gateway? The mail gateway is a email filter capable of blocking spam and virus laden emails. Highly configurable, the filter is compatible with popular open source MTA's for Postfix, Sendmail, qmail and Exim. Is it possible to scan individual files or folders? Yes, you can simply drag and drop files or folders for instant scanning. Can I create custom scan profiles? configure to scan daily only certain files and folder? Yes. You can create custom profiles which instruct CAVL to scan specific files, folders and drives. Once created, these profiles can be used in a scheduled scan.